After deciding on a helium pressurization and leak test approach, Heatcraft consulted with several vendors and decided to work with Serv-I-Quip, Inc., a Downingtown, PA, U.S.-based supplier of testing equipment, and Inficon, a Syracuse, NY, U.S.-based supplier of leak detectors. Together, the companies developed a complete testing system that reduced cost and improved productivity. Mr. Gant says there were several reasons Heatcraft decided to change to helium leak detection. “Because the helium leak test systems are able to find smaller leaks, our customers will be getting coils that they can use with confidence, thereby increasing customer satisfaction, reducing warranty costs, and reducing field related leak problems,” he explains. In addition, the previous testing method was an off-line process that created a bottleneck between manufacturing and shipping, adds Mike Richey, president of Serv-I-Quip. “Leak testing is now integrated into the manufacturing process. Product goes directly to boxing and shipping after manufacturing,” he explains. Specifically, the integrated process eliminated material movement from the production environment over to the water bath area and the subsequent evaporative baking ovens to dry the product. The installed system consists of a Helium and Air Gas Mixing and Recovery System and DataTest NH100 Test Stations from Serv-I-Quip and Protec Helium Sniffers from Inficon. The Mixing and Recovery System generates a pre-set mixture of helium and air at a pressure and volume that meets Heat craft’s production requirements. After the gas is used to leak test units, the gas is vented to a recovery line and brought back to the system to be processed for reuse. 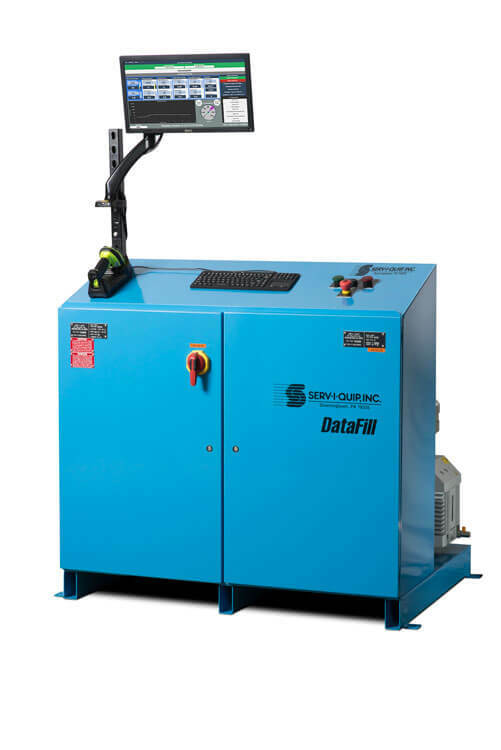 The DataTest 100 utilizes a bar code scanner to automatically set up the appropriate test cycle. A normal test cycle includes a UL pressure test, a pressure decay test, the helium leak test, test gas vent to recovery, and a final rough evacuation. According to Mr. Richey, typical cycle time is less than 30 sec. The network-connected PC in the test station sends all test and production data to a centralized server, providing easy access to data. When developing the complete system, Mr. Gant says that both Serv-I-Quip and Inficon worked very closely with Heatcraft engineers to develop a system optimized for it specific needs. “During the early stages of the Inficon startup, we realized that it confused our operators to show leaks in the 10-7 atm cc/sec range. The graph was constantly going up and down. Inficon changed the system so that the graph would start sniffing in the 10-6 atm cc/sec range. Since our rejection point was 1.8 x 10-5 atm cc/sec, this worked out fine,” he explains. Heatcraft’s initial goal was to find a better quality leak testing method that could be incorporated into production without inhibiting through-put. All three companies believe this goal was achieved, as well as some additional benefits. Another benefit that Outokumpu Heatcraft can now provide to their customers is improved Work-in-Process information, adds Mr. Richey of Serv-I-Quip. “By tracking manufacturing data at the leak test station, Heatcraft can advise their customers on the status of their order and a delivery schedule. This is valuable information for a manufacturer scheduling production and inventory receipts. Heatcraft can also now provide unit test data to satisfy customer quality requirements or ISO procedures,” Mr. Richey explains.